In 1985, Cooper Hewitt received a gift of seventy-eight woven labels from ASL Industries of Great Neck, New York. The company specialized in the manufacture of woven labels for clothing, luggage, toys, and shoes. The majority of the gift included labels for major retailers and garment manufacturers like Gap and London Fog, but a few were made for food and beverage companies such as Diet-Pepsi, Hershey’s and Ronzoni. ASL Industries was formed in 1948 through the merger of two Manhattan companies: Capitol Label Company, owned by Albert Sontag, and the American Silk Label Manufacturing Company, purchased by his son Rollin Sontag in 1948. Little is known about Capitol Label, but American Silk Label Manufacturing started operations in 1875 on 389 Broome Street. In addition to woven labels, American Silk Label Manufacturing Company produced woven souvenir bookmarks with commemorative and political subject matter. 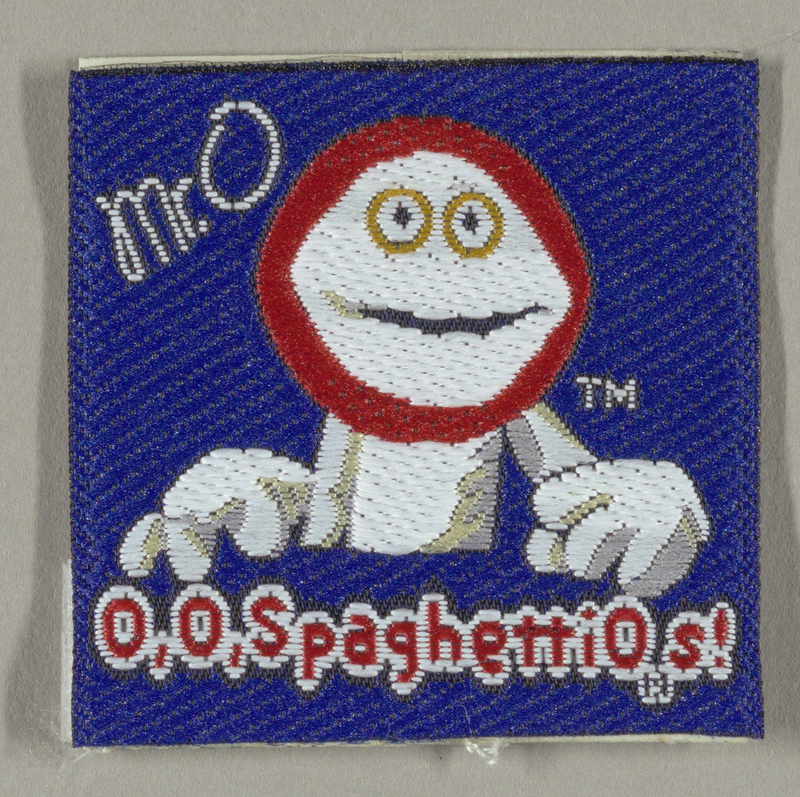 This woven label is for the canned pasta SpaghettiOs that was created in 1965 by Donald E. Goerke (1926–2010) of the Franco-American brand, a division of the Campbell Soup Company. The Los Angeles Times wrote in his 2010 obituary that Goerke was known as the “the Daddy-O of SpaghettiOs.” How the label was used is unknown, but likely was attached to items made to promote the circular spaghetti. 1 Lawrence Van Gelder, “Long Islanders; If They Can Make It, He Can Label It,” New York Times, September 9, 1984. My raincoat has a label, “WEAR IN GOOD HEALTH” so I wrote the CEO of the manufacturer, Misty Harbor, NYC, thanking him for the extra effort at positive customer relations. I mentioned that my father spent his entire life in the garment business. He was very pleased to get such feedback, and probably surprised. He sent me a nice thank you note. Label, New York, USA, 1980–85, jacquard woven synthetic fiber, Gift of A.S.L. Industries Inc.